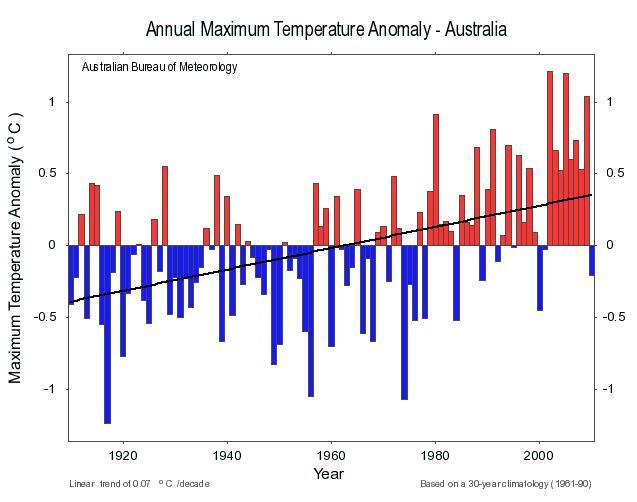 In this analysis I have looked at maximum temperatures across Australia including 2010. Why Maximum temperature? Well, that’s the temperature we talk about when we think of how hot it was today. As well, maxima should be least affected by Urban Heat Island effect, and should respond to El Nino/ La Nina conditions. Before I go any further, let me agree once and for all that 2001-2010 was definitely the warmest decade we have records for. So, here is an alternative analysis of Australia wide temperatures- with a few surprises. My data source was the raw maxima for the 100 non-urban High Quality sites, and from other nearby sites when records needed to be combined (typically up to 20 km away, sometimes up to 35km) as published at Climate Data on the BOM website. I later included data from the 34 Urban sites as well. I used the original (and much stricter) criteria of Torok and Nichols (1996) and only used stations with at least 80 years of data, and similarly Della-Marta et al.’s requirement to have stations with at least 1 year of data overlap if it was necessary to combine records into a splice. Consequently, a lot of sites were excluded (29 non-urban, 5 urban) because they did not have enough data, or because no true comparison could be made between modern and historical data. What remains is a better quality record but which still is less than perfect. A surprising number of sites had no 2010 data yet, because 1 or 2 months (usually December) had data not yet quality controlled ( over two months later). Possibly the lower than usual temperatures flagged a warning that manual checking was needed. I estimated annual data by finding the average of daily maxima for the whole year. It quickly became apparent that West Australia behaves differently to eastern states. This may be partly due to the data bug in WA data discovered by Chris Gilham and apparently not yet fixed. Or perhaps we should regard West Australia as having a completely different climate system. Certainly West Australia is not affected as much by the La Nina/ El Nino effects. 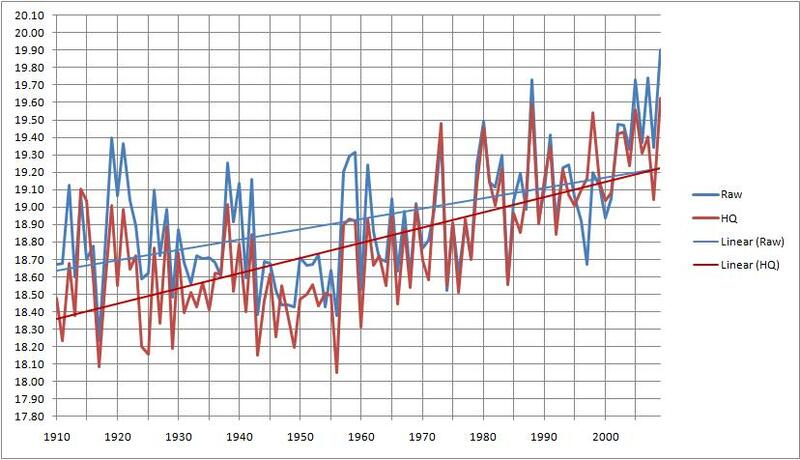 Notice- the cool years 1917 and 1956; the shifts up about every 20-25 years; 2010 was cooler than any year since 2000, but still 0.11C above the 1961-1990 average. The 101 year trend is about 0.65C . 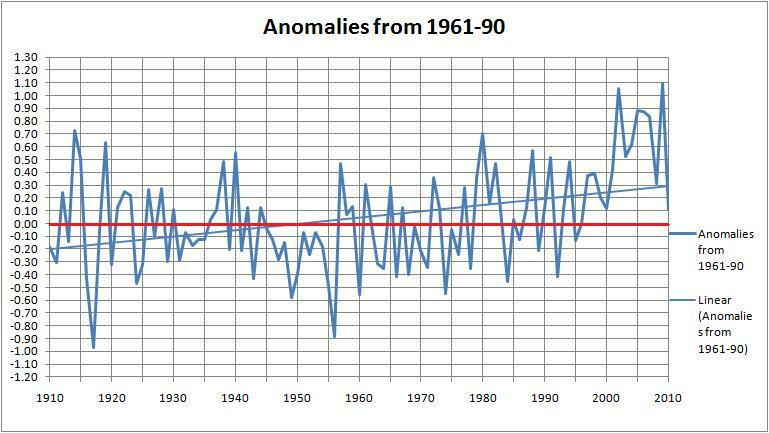 Note 2010 is below the 1961-90 average. My figures don’t agree with this probably because of the sites I excluded because of poor data. The trend is similar- 0.7C. 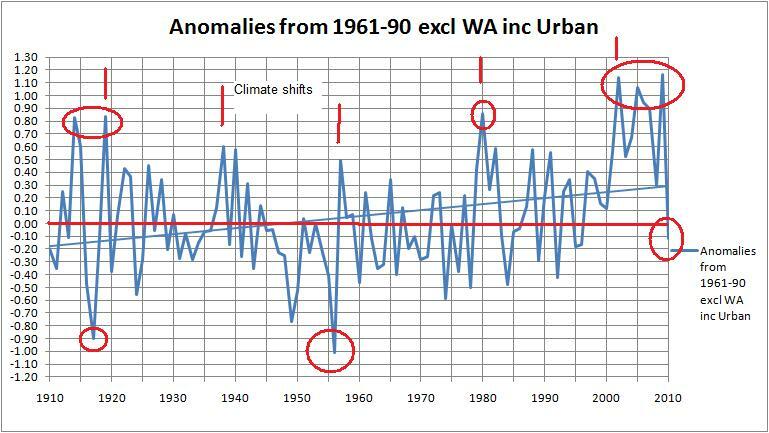 But look at this:- Non – urban sites excluding WA: Notice that the 2010 anomaly is now -0.22C, and that 1956 is cooler than 1917. Wow! 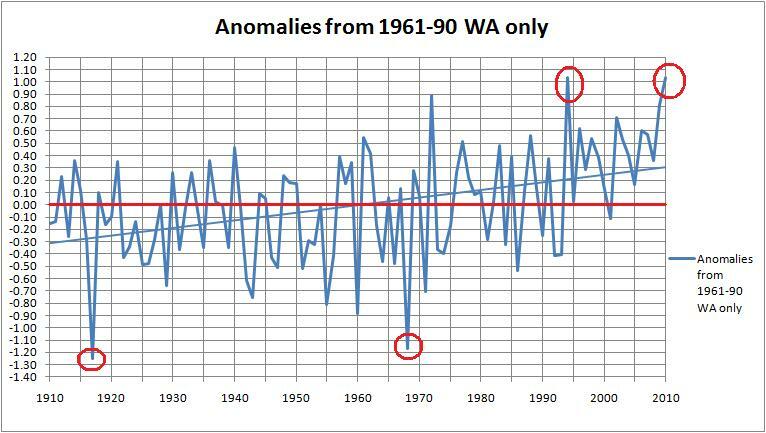 2010 was definitely very hot in WA- anomaly of +1.04, just pipping 1994. And 1968 is only just warmer than 1917. Now include Urban sites in the mix- in fact, all Australian sites, urban and non-urban ( 100 sites). I should point out that I swapped Melbourne’s Moorabin Airport for Melbourne Regional Office to avoid UHI. Note the step ups in climate, and a trend of about 0.5C. Finally, here are the graphs for Urban sites only- remember, BOM excludes these from their climate analyses because of their urban warming signal. 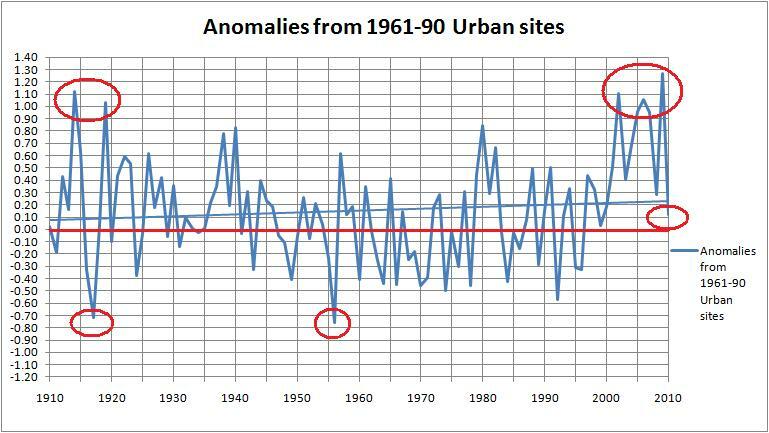 Hmmm… as we’ve seen before, urban sites are warming less than non-urban- in fact hardly at all (less than 0.2C). And apart from 1956, not greatly different to non-urban. 2010 anomaly 0.12 compared to 0.11. Coastal sites (0.65) are warming faster than inland (0.35), inland sites fluctuate up and down more violently, and inland sites were much cooler in 2010. 2010 was definitely not a warm year. Rain and cloud were associated with cooler temperatures in inland Australia. Maxima do not rise steadily, but in a series of step ups about 20 – 25 years apart. There was a distinct decadal spike beginning in 2002- coinciding with drought conditions across much of the continent. The first decade of the 21st Century is definitely the warmest we have records for. The inclusion of urban sites reduces the trend. Inland sites are warming less than coastal sites, but also were cooler in 2010. They are more volatile, warming faster and cooling faster. Proximity to the sea moderates temperature change. West Australia has a distinctly different climate from the rest of the country. There is no reason for the Bureau not to include urban sites in their climate analyses. The next few years will show whether the warming trend is continuing. Four times I heard on ABC radio this morning, confirmed by a Google search, that China has unveiled a plan to produce 11% of its power from non-fossil (i.e. nuclear) fuels by 2015, and to cap its energy consumption from fossil fuels at 4 billion tonnes of coal equivalent. Wow! And just in time to shame Australians who aren’t keen on Julia Gillard’s (or anyone’s ) Carbon Tax. Except this is not a Carbon Tax, but government regulation. Now what was it the Opposition was proposing? I thought I’d run the old Reality Check calculator over these reported figures. In 2009 energy consumption was about 3.06 billion tonnes of coal equivalent, but by 2010 it was up to 3.25 billion. By 2015 China will cap its fossil fuel energy consumption at 4 billion tonnes of coal equivalent. That’s an increase of “only” 23% in 5 years. Up by nearly a quarter. Compare that with Australia’s 2008-2009 figures: using the approximate conversion factor of 1 tonne of coal = 29.3 Gigajoules, about 0.197 billion tonnes of coal equivalent (source: ABARE). That’s right, China will increase its fossil fuel use by three and a half times Australia’s annual total. It’s the cap you have when you’re not having a cap. And no doubt the Greens and ALP will hail this as a reason to introduce the Carbon Tax. Readers familiar with my analysis of the official climate record of Australia may be wondering what has happened since Part 8 posted in July last year. I have had ongoing correspondence (on my part) with BOM, and a reply on behalf of the Minister, Tony Burke MP. I posted an Open Letter in reply (see below). I have made some changes to some sites- notably in New South Wales- and reassessed some trend figures in Victoria and Cape Bruny in Tasmania. I have gone back to my original assessment of Bowen in Queensland. 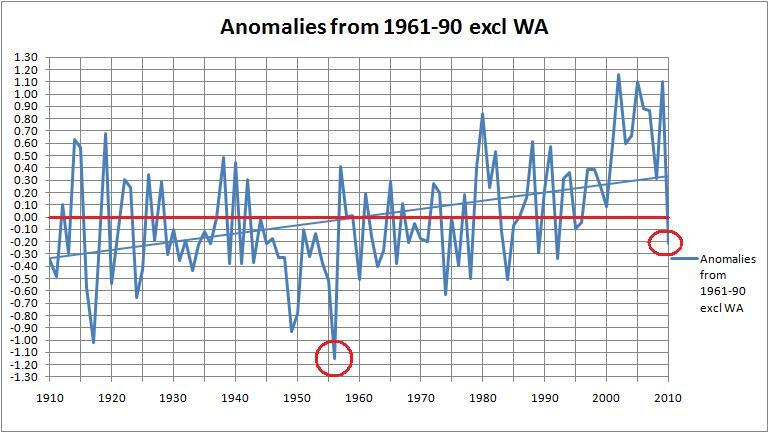 A point that needs emphasising here is that anyone going through the data could come up with a slightly different result each time- as the subjective, manual method used by BOM is not reproducible. Another is that many of these sites should not be used at all because of missing or short data, urban influence, or lack of good overlap. The changes? While I have reduced NSW’s overall warming bias of raw vs BOM’s published figure from 60% to 45%, this has involved a reduction in the average adjustment of only 0.02 degrees C; Victoria’s warming bias of over 140% is unchanged. 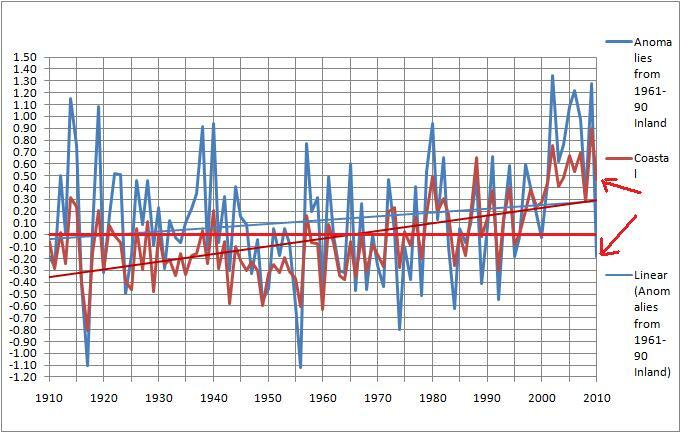 The Australia-wide average amount of adjustment per site is +0.22 degrees C per 100 years- down from 0.23. The median adjustment is 0.25C (a change of 0.025 down from 0.275C, or one place in the ranked list of stations.) 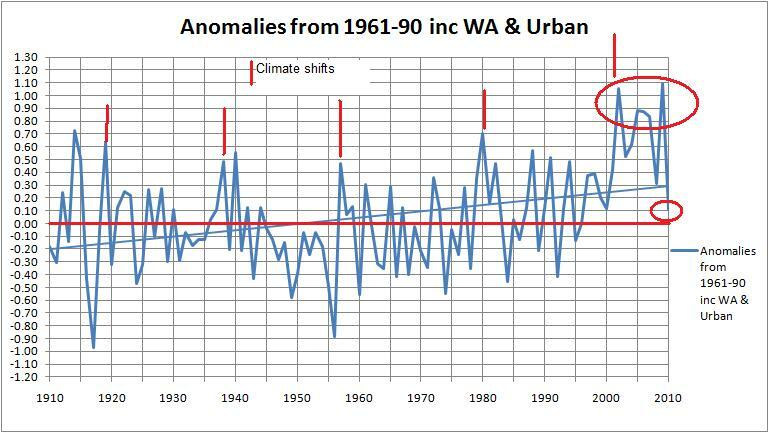 And the Australia wide graph is unchanged, with the difference in trends of 0.25C exactly the same. Once again, the results speak for themselves: when the results of the homogeneity adjustments are compared with the raw data, there is a discrepancy of over 40%. My next project is to plot the trends in maxima to 2010, just checking how hot 2010 was. Just to whet your appetite, here’s BOM’s own plot for Tenterfield NSW- I can’t be accused of not doing my sums right or cherry picking. No, one station does not prove anything, but watch this space. You are currently browsing the kenskingdom blog archives for March, 2011.